Email Signature Manager is a powerful Outlook email signature and Exchange disclaimer solution that also works with iPhone, iPad, Blackberry and other mobile devices, as well as with Office 365 and Outlook Web App. Email Signature Manager offers easy control over corporate email signatures and disclaimers, and also offers scheduled email campaigns. It is easy to include a company logo as well as other relevant images and graphics. Integration with Active Directory (or other custom data source) helps ensure that signatures shows correct contact information. You can convey your corporate identity and brand on all emails through full centralized control over email signatures, email disclaimers, email font face, email font size, colours and stationery. 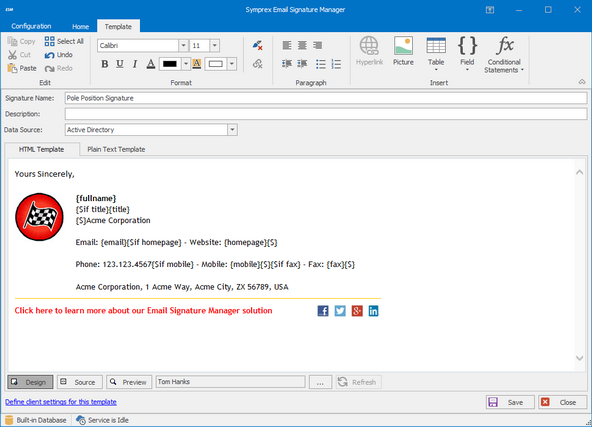 Email Signature Manager offers a powerful editor to design signatures, disclaimers and campaigns in all Outlook email formats. Ensure professional email communication through consistent signatures, correct contact information, legal disclaimers, and optionally include marketing information, on all e-mails from your organization. "As part of a major re-branding exercise Fairtrade Foundation needed way of deploying standardised Outlook e-mail signatures to around 175 users, and be able to manage them centrally. The solution also had to be flexible enough so that the e-mail signatures could be customised as new campaigns were launched during the course of the year. Email Signature Manager has been the perfect solution for this requirement; the deployment and on-going administration has been an absolute breeze, and has simplified what used to be a very onerous task. An added bonus has been that e-mail signatures for Outlook Web App now also have a consistent look-and-feel." Try the FREE evaluation version today to discover why thousands of organizations worldwide have chosen Email Signature Manager as the solution to their email signature and disclaimer requirements. Centrally manage permissions on mailbox and public folders, and mailbox delegates, across your entire organization with this essential solution for Exchange administrators. Among thousands of customers this solution is being trusted by some of the world’s largest corporate law firms. Centrally manage out-of-office replies for all users in your organization to help improve customer service and internal communication. For example this solution allows receptionists and secretaries to manage the out-of-office replies for staff at the click of a button. Symprex is headquartered in London and focuses on developing value add solutions for Microsoft Exchange, Outlook and Office 365. Symprex markets and supports its products from this web site and through our extensive partner network. Symprex has more than 10,000 customers in over 100 countries in public services and any industry with more than one million licenses sold. Contact | Legal | Privacy | Pay Invoice | Twitter | Facebook | LinkedIn © 2019 Symprex Ltd. All Rights Reserved.